The Tau advance finally clears the farm village where Imperial artillery fire had so effectively delayed the xeno troops. “There were thousands of them! And their weapons … the firepower that was hitting our lines was beyond anything I’ve every seen before. We didn’t stand a chance.”—Transcript, interview with Troop Nadi Boramus, post-battle analysis by military intelligence officers. Although the rising sun improved visibility, the Tau forces were still maneuvering out of range of most Imperial weapons. While armor and artillery fired round after round, the only casualties reported was the loss of a Tau Piranha spearheading the xeno advance. Determining a short advance would put the Tau into range of its infantry, the Mechanicus commander ordered his infantry forward to assume a new position where a primitive agricultural fence provided some cover. 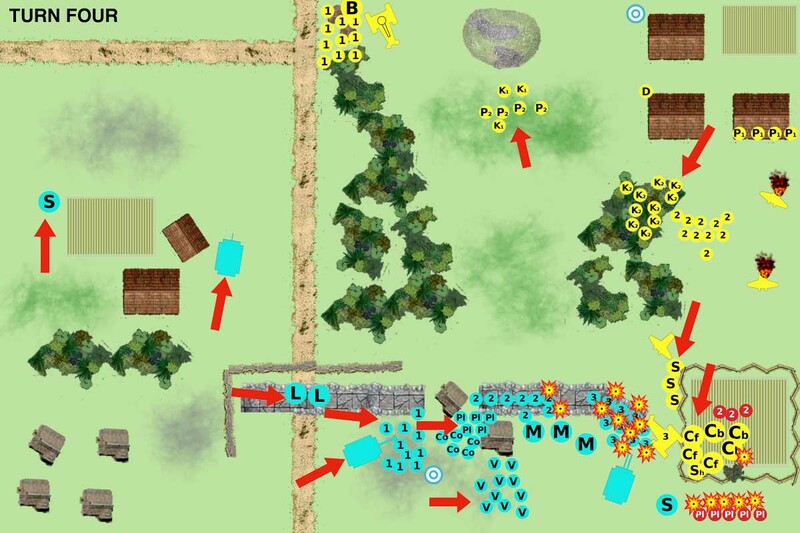 On the left flank, the Sentinels continued their scouting, reporting back to HQ that no enemy appeared to occupy this part of the battle line. Given the need to eliminate the Ratling threat, the Tau advance had slowed, but with the Imperial abhumans dead, the Tau march eventually began picking up speed again. There was significant long-range fire by the xenos. The Hammerheads and Broadsuits continued to target Imperial armor but had no success in harming the well-entrenched tanks. One Stealth Suit managed a lucky long-range shot and scored a hull wound against an Imperial Sentinel. At this time, streaks of flame were spotted in the sky. A giant xeno aircraft [Code name: Manta Missile Destroyer] crossed overhead at high altitude, and a squad of Crisis Suits were jettisoned for a rapid aerial descent. These combat suits fell rapidly, making it impossible for Imperial anti-aircraft weapons to target, and with pillars of flame slowing their descent, they landed among the Tau Piranhas. The Deep Strike of the Crisis Suits greatly increased the already significant firepower of the xeno advance. Equipped with twin-linked burst cannon, the Crisis Suits, supported by the Stealth Suit Team and nearby infantry, released a firestorm of hostile fire at the advancing Skittari. The front line was wiped out to a man, and the second line suffered 30 percent casualties. Grimly aware of the might of the advancing xeno line, Imperial troops continue their fire, only to see their lasgun rounds avoided by the fast-moving vehicles and battle suits of the enemy. One Sentinel manages to target a skimmer that was forced to slow to avoid a collision with a passing Devilfish, and a barrage from Imperial mortars managed to bracket a Crisis Suit team, although it only manages to wound one xeno. The lone Sentinel finally reached the edge of the cornfield, where a long-range missile exploded to its front, revealing the heavy guns of the Tau in the distance. The Sentinel had been advancing at full speed and thus could not return accurate fire. The Tau advanced to close range of the Imperial line. At this moment, more pillars of fire appeared overhead as Commander Swiftstrike and his fusion blaster-equipped Crisis Suit team landed, hitting the ground in a narrow landing area identified by a homing beacon. The commander immediately opened fire on the Exterminator tanks, only to discover that their frontal army iswas so thick that it would take a lucky shot to penetrate. It was clear that it would be necessary to turn the armor’s flank. The other Crisis Suit team opened up with its burst cannons, wiping out half of the Mechanicus troops still in the battle. A Hammerhead shell landed in the trench line, killing two soldiers. Piranhas and Stealth Suits openned up with a mix of fusion blasters and burst cannon. One Sentinel was immobilized, while another took a second hit. While the second Sentinel’s armor was not penetrated, the repeated damage done by the xeno weapons finally lead to the walker’s collapse. The Broadsides, which had maneuvered to defend the Hammerhead platoon, fired its heavy plasma rifles but missed the scouting Sentinel on the far flank. At this point, fate intervened. A random xeno shell landed upon the Imperial command post. Several officers are killed, and Capt. Stark—hero of Dar Sai—is injured. Unconcious, and unable to maintain command, he is evacuated to an aid station, while his XO, Delmara Stryker, assumes command. Stryker’s task was unenviable. The xenos had concentrated all their forces on one point of the Imperial line, and they had reached the lines relatively unscathed. It is not for want of trying. The Imperial Guard fired fired everything it have. 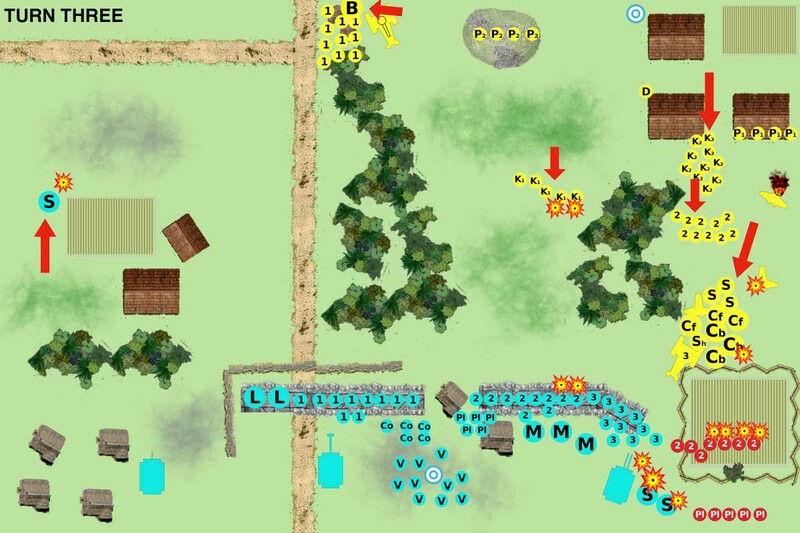 Lasguns, las cannons, auto cannons, battle cannons, mortars—no weapon went unfired where an enemy stood. Yet, the Tau armor and speed proved decisive. One Crisis Suit was injured—yet no other xenos fall. Still, the battle was not lost. It is clear that the xenos were trying to seize the main communications array of the Imperial army, and Lt. Stryker ordered the western trenches emptied. All men that could be spared were to surround the communications array and protect it. All men, except members of the 12nd Mechanized Infantry Co. Made aware by the Sentinel platoon of the open flank of the enemy, these troops launched a desperate attack against the Tau heavy guns to the enemy rear. If they could be destroyed—or distracted—it might turn the tide. If not, just having Imperial troops within the Tau rear might cause the xeno commanders to pull forces back to protect their flank. The Tau went for the kill, and the crisis of the battle was at hand. 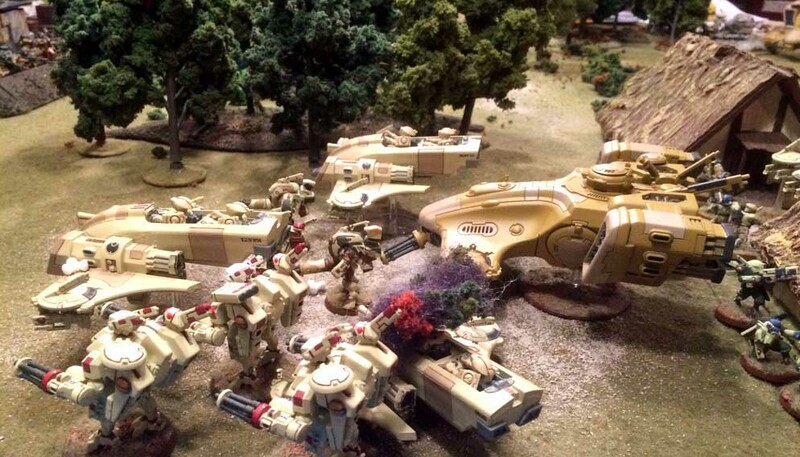 Markerlights targeted the Adeptus Mechanicus, and the Tech Priest’s platoon command squad was wiped out. The Skittari were no longer a factor in this fight. The mechanized Tau infantry was finally in position. Aiming its burst cannons up the trench line, a Devilfish turned the previously safe haven into a death trap. A squad of Imperial Guardsmen were massacred in seconds. Stealth Suits target a second squad, killing at least 20 percent of the unit. Meanwhile, Swiftstrike and his Crisis Suit team fired round after round from their fusion blasters at the Exterminators—and, to their frustration and growing fear, they could not penetrate even the flank armor of the tanks. The armor was pitted and scarred—but it held.